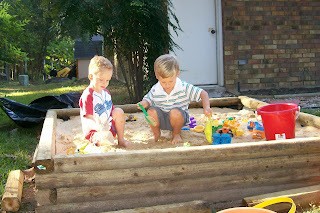 Dawson and Carson playing in Carson's giant sandbox. Carson is one of Dawson's new friends and he tells us that Carson is his "best friend." They are about the same age, doing similar things, and they seem to play really well together. It's so neat to see Dawson entering into friendships with other kids.